The collection of three wrist watches that Chanel presented in Basel last March has a symbolic significance. n 1932, Gabrielle Chanel creates her first jewelery collection simply called Diamond Jewelry. It will be scandalous in the profession, but will initiate a movement to come: the entrance of the couturiers in the very closed world of the high jewelery. In 1987, the double-C house puts on the market its first watch: it is called naturally first. In 2017, 30 years later, Chanel dares to immerse herself in the most intimate origins of Gabrielle Chanel to adorn a watch set with the Mademoiselle Privée collection. And these roots, it is necessary to go to seek them in the depths of the Corrèze, in the orphanage ofAubazine. It is there that Gabrielle Chanel was abandoned with her two sisters by their father in March 1895.
famous world: the famous two C intertwined. The watch's white gold case, set with 552 brilliant-cut diamonds, is an elegant way to sum up the fabulous destiny of Miss. The avant-garde seamstress knew how to transcend her miserable childhood in fashion empire. She had the intelligence to feed on everything she saw, including the poorest elements, to turn them into symbols of wealth. Gabrielle Chanel never spoke of this childhood of abandonment, inventing severe aunts who would have given her a good education. But traces of his past are found in all the codes of the house: his love of white and black, which is explained by the perimeter of the windows of the orphanage, his fascination with the symbols of the sun and the stars, that we find on the floor corridors leading to the dormitories and trampled for years. Coco Chanel was an alchemist: the watch series Mademoiselle Privé Aubazine This is the proof. Every day, she contemplates the Cistercian windows of the abbey. Every day these non-figurative motifs imprint themselves in his mind. When it launches its brand in 1913, the one that became Coco Chanel, will use these geometric themes to create its logo become the most famous world: the famous two C intertwined. Limited edition and numbered 5 copies. • White gold 18 carats. • Box set with 552 brilliant cut diamonds. • White gold crown 18 carats set with a diamond. • Dial set with 136 brilliant cut diamonds and 32 baguette cut diamonds, black rhodium-plated white gold fillets. • Needles white gold 18 carats. • Black satin strap with white gold folding clasp 18 carats set with 80 brilliant cut diamonds. • 42 power reserve hours. 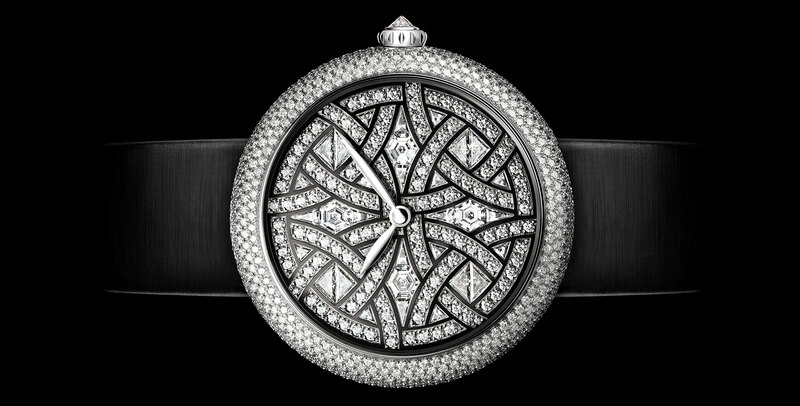 • Dial set with 188 brilliant cut diamonds and 24 baguette cut diamonds. nets of white gold rhodium black. • Box set with 552 brilliant cut diamonds (~ 3.03 carats). • White gold crown 18 carats set with a diamond (~ 0,19 carat). 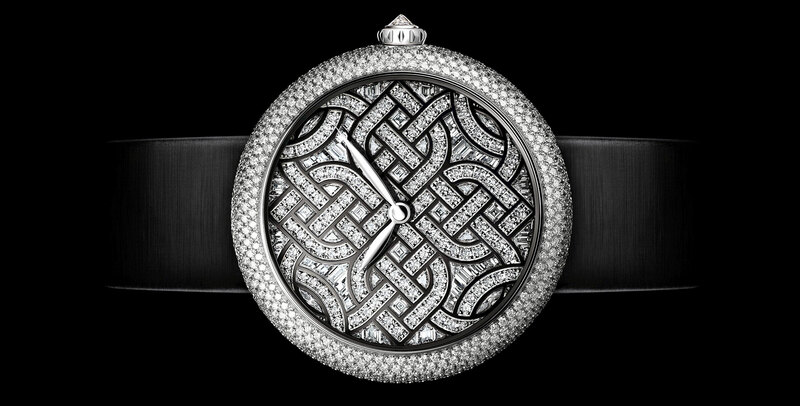 • Dial set with 144 brilliant cut diamonds and 64 baguette cut diamonds (~ 2,15 carats), black rhodium-plated white gold fillets. • Needles white gold 18 carats. Black satin strap with white gold 18 carat folding clasp set with 80 brilliant cut diamonds (~ 0,48 carat).